Born in Toronto, Paul started working professionally as a dancer/singer at the age of 15. He has performed for over 40 years in theatre, TV variety and specials, mini series, film, industrial shows and over thirty national and international television commercials. Film credits include “Hairspray” with John Travolta, “The Magic Show” with Doug Henning and Didi Conn, “Supertstar” with Molly Shannon & Will Farrell, “Feast Of All Saints” with Ben Verene & Jennifer Beals, “A Christmas Carol” with Henry Winkler. Paul has also performed with Karen Kain, Johnny Cash, Ronnie Hawkins, John Ritter, The Muppets and George Hamilton, to name a few. Additionally, he has performed for four years as the lead role and emcee in the Calgary Stampede Grandstand Show.Some favourite theatre credits include, “Oklahoma” at Theatre Aquarius, “Swing” with Drayton Entertainment and “The Best Little Whorehouse In Texas at Stage West. Some of Paul’s choreography credits include episodes for the children’s T.V. show “Noddy” for CBC and the mini series “Falcone” with Jason Gedrick for CBS. He has also choreographed numerous stage and theatre productions. Paul is currently performing “All of Me”, a 30’s & 30’s Song and Dance Revue. He performs this cruise ship and club act with his daughter Carly. Paul also created and performs his original Electric Tap Act for industrial shows, festivals and theatres. 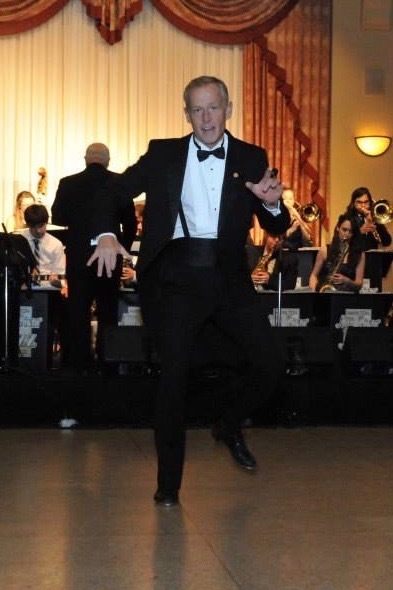 After operating his dance studio for over 20 years, Paul now enjoys teaching Tap, Jazz and Song & Dance at private studio workshops and national conventions.